Vicious Rumors deals 1 damage to each opponent. Each opponent discards a card, then puts the top card of their library into their graveyard. You gain 1 life. 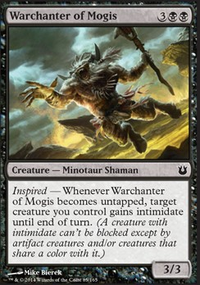 Thank you for the explanation on Vicious Rumors and Ashiok, Dream Render , the choices make a lot more sense to me. I do see the graveyard hate of the Sentinel Totem as being worth keeping in the sideboard, as it helps shut down Rekindling Phoenix , Find / Finality , Pteramander , Enigma Drake , Search for Azcanta Flip, and Arclight Phoenix , as well as the few jump-start cards you often see, such as Risk Factor and Chemister's Insight . This feels like a really nice variety of targets for what is, as you said, an extremely low opportunity cost to play the totem. I'm really skeptical about Urgoros, the Empty One as a finisher, and if you're just playing him for flavor/as a pet card, you can skip the rest of my spam. Otherwise, he seems really weak as far as dimir finishers go. While drawing one/making your opponent discard is fine, six whole mana for a 4/3 flyer seems extremely vulnerable to a vast multitude of commonly played removal spells like Lightning Strike , Lava Coil , Kraul Harpooner , Collision / Colossus , Vivien Reid and Shivan Fire as well as other, more niche spells like Skewer the Critics . As a comparison to Urgoros, we can take the new God-Eternal Kefnet . 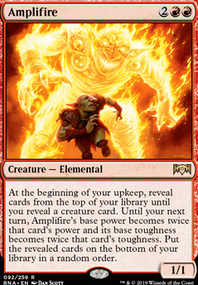 Kefnet not only dodges 3/4 damage burn removal, but also comes down much earlier while also dodging exile effects like Vraska's Contempt , Conclave Tribunal , the aforementioned Lava Coil and other sad endings your game-ending threat could meet. To top this, Kefnet provides an identical clock to Urgoros, with the added advantage of letting you rip discounted sweepers/removal off the top to stabilize a board in the midgame, or use a draw/targeted discard spell for some tasty card advantage. 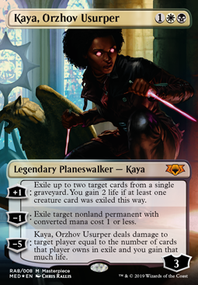 Alternatively, if you find that you don't need Kefnet's resilience due to your ability to protect Urgoros, I think Doom Whisperer is a stronger contender for the slot, as he lets you keep surveiling to spam fake news and sift out poor topdecks/flood. Doom also has the relevant addition of greater p/t, granting your finisher a speedier clock as well as incidental resistence to many of the previously mentioned removal spells, all for a lower cmc than Urgoros. Tyrant's Scorn and Narset are interesting. Scorn is a card i'll definitely play over a moment and a cast down. Totem is better than ashiok as the opportunity cost is smaller with the scry 1; there's not heavy-gy deck in standard so I'm even thinking about just removing it. Vicious Rumors is just not good anough since you're spending a card to get rid of the opponent's worst card (and you're spending a mana). Burglar rat provides a body so it's at least a 2-for-1 (even then, I'm thinking about cutting it). Urgoros, the Empty One is good because it gives us a big late game threat that just wins if not dealt with. Hey, I really like the look of this deck! I have a couple questions, however, about it. Namely, is there any particular reason for you not to be running Vicious Rumors ? Particularly over slower cards like your Urgoros, the Empty One , or more expensive effects like Burglar Rat ? 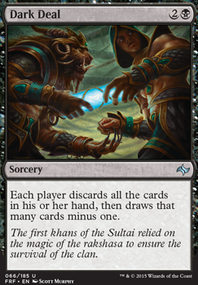 Secondly, what're your thoughts on the new Narset, Parter of Veils and/or Ashiok, Dream Render as sideboard cards? I can see the new Narset as being useful for control matchups where her passive would help keep your opponent's hand permanently empty, while also giving you some nice card searching with her -2. I also ask about Ashiok out of curiosity about whether you think she's better graveyard hate than the Sentinel Totem . She is slower and harder to cast, but she's reusable and only clears your opponent's graveyard while also milling them slightly. Finally, what do you think about Tyrant's Scorn ? 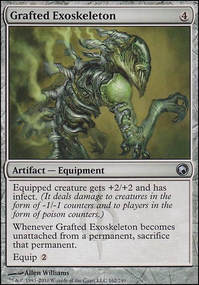 I think it seems like a perfect fit for the deck, providing efficient removal in the early-game, and then becoming efficient removal for any creature in the late-game with its second mode. Liliana's Caress is better on the sideboard. Bring it in against Faithless Looting decks. Cut all the colorless lands except Mutavault . I see no reason for all the fetches with DRS out of the equation. 8Rack typically doesn't run land base land destruction. It prefers Smallpox . You could also safely cut down to 20 lands. I'd consider adding 1-2 Collective Brutality and although not every one likes it several Vicious Rumors is good. I've considered both, and I'll explain my rationale as to why I did not include them previously. Read the Bones obviously has a 1 higher CMC, which isn't bad when you consider that with this deck you're playing the long game, but it suffers from the same issue that Night's Whisper has: they lack the ability for you to target your opponent and make them lose 2 life. Sign in Blood can be used for one's own card advantage early game, but it can also be used to make your opponent draw cards and lose life, because you want to pressure them as much as possible to die quickly to Corrupt and not be able to counter Dash Hopes with loss of life, especially in a control heavy match up. However, I could play test the inclusion of 2 or 3 Read the Bones in exchange for 1 Vicious Rumors and 1 or 2 Tyrant's Choice , as the former of the 3 cards would allow for better prospective plays and speeding the game up. Then again the fun thing about this deck is just top decking answers and frustrating your opponent into submission, but I definitely think that Read the Bones is a good idea. The deck looks good. I would consider replacing 2 Vicious Rumors and 1 Notion Rain in your main deck with 3 Aether Tunnel to make your creatures unblockable. Theme 1 seems to be vampires- unfortunately though the focus seems to be off of a mono-b or b/r tribal vampire deck, and we aren't running any one drops so creature-based aggro isn't really possible as we are guaranteed to be behind on turn 1 with our best and only play being Vicious Rumors which we only have in our opening hand 40% of the time. When we do have it, its super underwhelming as there are a bunch of better options that you get to pick the card they are discarding ( Thoughtseize , Inquisition of Kozilek ). I recommend if you want to go the vampire route to look up other vampire tribal aggro lists and try to copy their curve and best low cost creatures. In modern as high of a 4 CMC of 2.65 is usually reserved for slower control decks, as an aggro deck you want to get on the board as fast as possible. 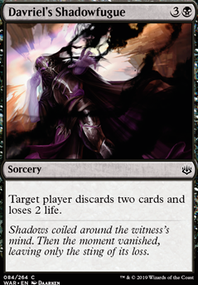 Theme 2 is the main theme, which is making our opponent discard cards to make them take damage with Liliana's Caress , but that card only has a 40% chance of being in our opening hand as well. The best option for this style of strategy would probably be an 8-rack deck based around Shrieking Affliction and The Rack , as it's more likely to draw either of these win conditions as well as the damage is higher. Although those decks are very expensive and will not make you popular, i personally find them fun. They are very fast and control your opponents hand very firmly, the problem I have with yours is by turn 3 control decks can prevent you from forcing discards, or they can simply discard something they dont need and keep their best cards, which Thoughtseize can help stop, or they can simply remove Liliana's Caress by then too. This is actually an interesting idea. I don't really play much standard, but I think this has potential. Although it is a bit slow and tends to whittle down your opponents very slowly, all of the hand control will make it very hard for your opponent to win. The Light Up the Stage type cards also work very well, since you can usually cast most of the spells. I suggest adding Skewer the Critics instead of Vicious Rumors .